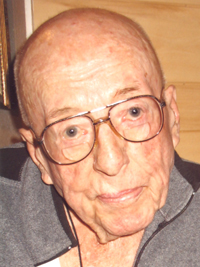 Millard Leo Meanea, 99, of Central Valley, Utah, and formerly of Carey, Idaho, passed away peacefully on Easter Sunday, April 20, 2014, in Richfield, Utah. He was born Feb. 16, 1915, in Denver, Colo., to Theodore Edward and Amelia Maude B. Haak Meanea. Millard spent his early years growing up in Denver and on the family ranch at Golden, Colo. While prospecting in Idaho, he fell in love with the mountains and valleys around Carey, and vowed to return. During World War II, he joined the Army Air Corps. When that project was canceled, he enlisted in the U.S. Marine Corps. He served in the occupational forces in Japan. While in the military, he met the love of his life, Christine Greenwood, who was in the Army Nurse Corps. They were married at the Santa Ana Air Base in 1943, and later solemnized in the Idaho Falls LDS Temple. She preceded him in death in 2009. They moved to the Carey Valley in 1945 where he farmed and also worked at the Idaho Atomic Energy site. He also worked at Self Manufacturing in Twin Falls, Idaho, as a draftsman and machinist. He was active in many community and national organizations including the American Legion, Soil Conservation District and the Blaine County Recreation District. He served in numerous positions in the LDS Church including bishoprics and chapel building committee chairman. He and his wife served in the Las Vegas, Nev., mission, assigned to the Reno area. After their mission, they spent the winters in Surprise, Ariz., and summers in Carey. They moved to Central Valley, Utah, in 2000 to be closer to their son, Pat, and grandchildren. He is survived by a son, Millard L. “Pat” (Sherry) Meanea II; grandchildren: John Edward (Alice) Meanea, David Millard Meanea, Matthew L. (Christina) Meanea, Alicia (Marvon) Willson, Joseph Newell (Kristin) Meanea and Christy Jean (Paul) Marshall; 16 great-grandchildren; and 3 great-great-grandchildren. He is also preceded in death by an infant son, Tommy; parents; brothers: Fredrick, Forrest and Ted; and a half-sister, Frankie. The family wishes to thank the staff at the Beehive Home of Richfield for their loving care and kindness to Millard. Also a special thanks to Claudia, Doreen and LaNeeta for their tender care of him and to Intermountain Hospice of Richfield. Funeral services will be held Friday, April 25, 2014, at 11 a.m. in the Central 1st LDS Ward Chapel, where friends may call from 9:30-10:30 a.m. Additional services will take place on Saturday, April 26, 2014, at noon in the Carey Idaho LDS Ward Chapel, where friends may call from 11-11:45 a.m. Burial with military rites will be in the Carey Idaho Cemetery. Funeral directors are Magleby Mortuary, Richfield, Salina and Manti. There is an online guestbook at www.maglebymortuary.com.